Be sure to check out the NEWLY added Suggie Safe Wheels page HERE! Updates on the Glider Gear page! New pre-made cage sets and available fleece! If you've recently tried to contact me via the contact page and I haven't responded, I apologize. I've had issues with my emails going straight to my spam folder for some terrible reason, which has left me unable to reply in an appropriate time. I have fixed the matter, so thing should be up and running like normal now. Thank you and sorry for the inconvenience. What Sugar Exotics is all about. 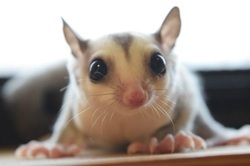 We, like so many others, fell crazy in love with Sugar Gliders as soon as we laid eyes on them. We fell for them so hard that we acquired 4 within the first 4 months of owning them - I know, it was a bit rushed. Luckily, we had done hours upon hours - practically months - of research and knew what we were getting into, which made it so much easier than just jumping at the first available glider(s) we could find. This is where a lot of people really mess themselves up. They don't realize exactly how much time and energy can go into owning these adorable little creatures. That's the main reason we decided to start our own site. We wanted a site where we could share as much information as possible, without all the confusing stuff in the middle. Information isn't the only reason we decided to start Sugar Exotics, we're also hobby breeders. We've recently downsized our breeding program and now only have one breeding pair. That's right, one! All of our boys (besides Norman) are neutered! We've never been like other breeders out there, we've always had very minimal breeding pairs because they are our pets first and foremost. We don't rely on them as a source of income, we just look at joey money as an added bonus. And 9 times out of 10, every single penny goes back to the gliders. So many breeders out there acquire multiple pairs all at once and get overran with joeys, which is no good! It's good if you have the time and potential new homes, but we feel you can't spend enough one-on-one time with all your joeys when you have 10-12 come OOP all at once. For those that can, more power to you! We strive to have happy, healthy, and friendly joeys that welcome their new mommies and daddies with open arms. 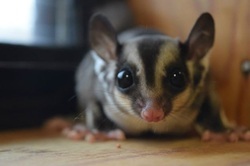 Aside from general information and available joeys, we also make Sugar Glider cage sets and cage set items! We make anything from a regular pouch to bridges to our signature item, The Glider Bucket! Be sure to stop by the Glider Gear page for more information! Yes, I said WE! 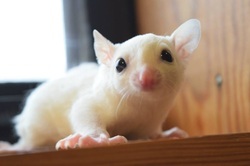 We're definitely not your average single breeder, we're sisters that share the same love for gliders, as well as other things. After all, we went into glider ownership together, as well as breeding. It can be confusing at times, but 99% of the time you're only going to be dealing with me, Megan. LaVaughn is the quite one, but we have equal parts in the duties of owning, breeding, and sewing -- we come as a team. We're both animal loving girls that have been surrounded by animals all of our lives. Be it chickens, cats, dogs, or even rats, we'll take (and love) them all. Like Sugar Exotics On Facebook!